The blue swimming crab (Portunus pelagicus) is among the important local and export commodities in Chonburi. It is a national delicacy that is in high demand among locals as well as tourists. In 1998, the harvest of blue swimming crabs from the Gulf of Thailand reached a peak of 37,281 tons, from 18,708 tons in 1985. Harvest of blue swimming crabs continuously declined after the late 1990s to 15,132 tons in 2009. The decline was associated with overharvesting, of both the gravid (pregnant) crabs and young crabs, as well as environmental degradation arising from the coastal developments. 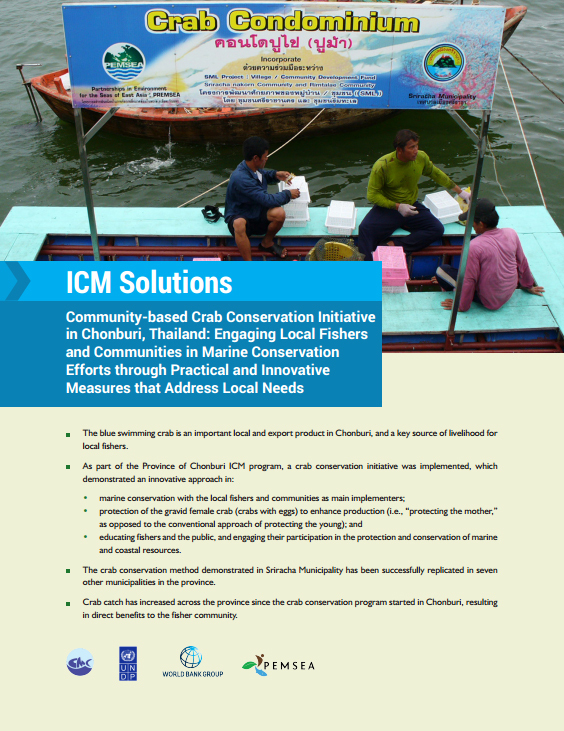 Local fishers and commercial operators, including those from Chonburi Province, were using collapsible bottom traps and floating seines, which captured the mature and gravid crabs, and the young ones as well. Some of the fishers relied primarily on the crab harvest as their source of livelihood. The significant decrease in the population of the blue swimming crabs affected the income of local fishers and threatened loss of their livelihood. In addition, the required quantity of blue swimming crabs for the local and international markets could not be reached, and the price of blue swimming crabs was going higher every year.